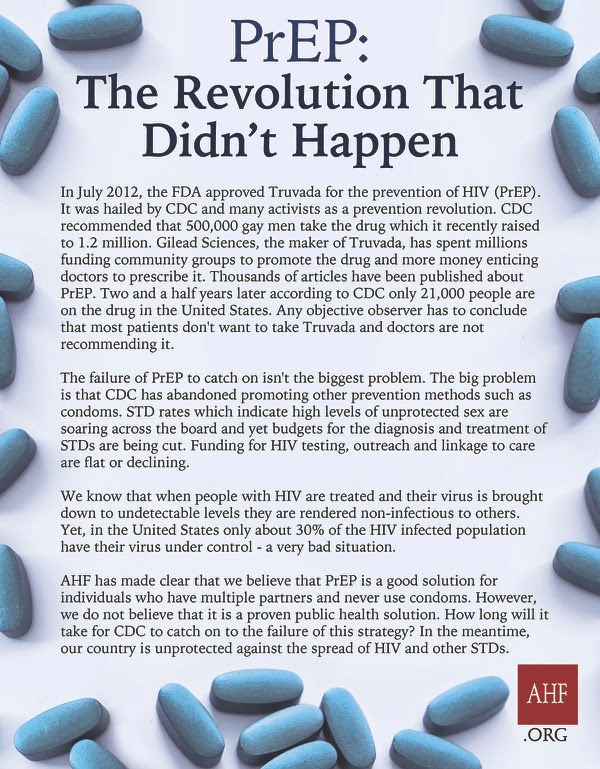 AHF Launches Yet Another Anti-PrEP Campaign - Joe.My.God. A new advocacy ad by the AIDS Healthcare Foundation (AHF) takes aim at the failure of pre-exposure prophylaxis (PrEP), the use of Gilead Sciences’ AIDS treatment Truvada to prevent HIV transmission in uninfected individuals, to catch on despite the fact that the powerful AIDS treatment medication has been approved by the Food and Drug Administration (FDA) for use as PrEP since July 2012 and that Gilead has spent millions to promote the drug directly to community groups and physicians. In 2014, the Centers for Disease Control and Prevention (CDC) initially recommended that 500,000 gay men and other high risk individuals go on PrEP to prevent HIV infection. In late November of this year, the CDC raised that number to 1.2 million in November to also include other “high risk” people including intravenous drug users and heterosexual adults without HIV who have an HIV-positive partner or have multiple sexual partners. Today, only 21,000 people are currently on PrEP in the United States, according to Dr. Jonathan Mermin, the CDC’s Director of the National Center for HIV/AIDS, Viral Hepatitis, STD, and TB Prevention (NCHHSTP).